I wanted to start a series where I would hold myself accountable for all the small beauty and lifestyle purchases I make that have an expiration date. This series gives me the opportunity to be mindful of my future purchases and allows me to write concise reviews and provide product recommendations. Without further ado, here are my skincare and makeup ’empties’ of February 2018! Double cleansing is a necessity in anyone’s skincare routine especially if you wear makeup or daily SPF. Clinique Take The Day Off Cleansing Balm is the only oil-based makeup remover that I’ve tried and since it’s fragrance-free and I can purchase it in stores, I’m going to keep purchasing it. I purchased this balm to heal the rough dry patches on my skin. The thick balm is infused with 5% panthenol and madecassoside which can heal and protect damaged skin from external factors. However, the small sized 40ml balm is not intended to be a staple in your skincare routine because panthenol can be drying on your skin over time. I believe that this is the best drugstore gel cream on the market. It gives your skin added hydration, helps seal in your serums, and when dried can be topped off with a thicker emollient cream without pilling. When purchasing, please look for the small text on the jar that says ‘Extra-Dry Skin’ or you’ll end up finding the original Neutrogena Hydro Boost Water Gel Cream. The difference between the two is that the ‘Extra-Dry Skin’ version is fragrance-free and dye-free when the original is not. The Ordinary 2% Hyaluronic Acid + B5 is a hydrating addition to your skincare routine. After dampening my skin with water, I apply a full dropper of serum to my face and wait three minutes to apply my next serum. I’m in love with lip balm and I have a team of people behind me who support it. 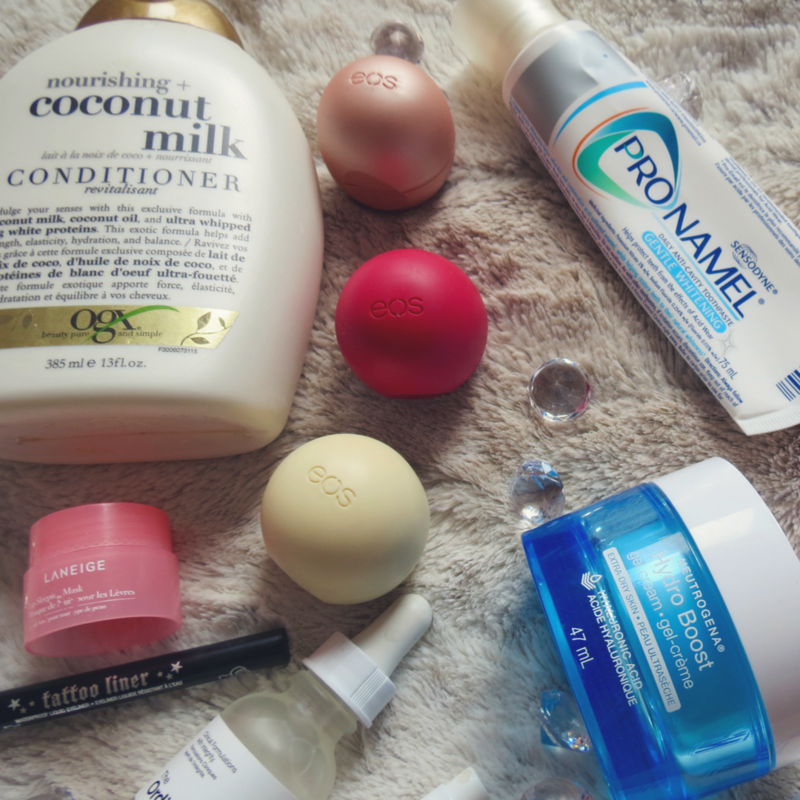 Over the past couple of months, I’ve tried a lot of different lip balms and the ones from EOS are still my favourite. The two flavours sparkling ginger (shimmery peach packaging) and vanilla bean (cream packaging) are from their 2018 holiday limited edition three pack and the raspberry pomegranate flavoured one (pink-ish red packaging) is from the organic collection. They are all equally moisturizing and leave no residue. I’ve tried so many drugstore alternatives that say they are as pigmented, long-lasting, and smudge-proof as Kat Von D’s tattoo liner and I always go back to the original. My mother gave me a sample of this perfume and I told her she shouldn’t have because I feared that I’d fall in love with it. It’s a gorgeous floral scent with notes of jasmine and it is a great choice for a young professional woman. This is an example where a product you didn’t think you needed becomes a necessity. I received this sample in an IPSY bag and it made me nostalgic because it smells exactly like The Body Shop strawberry lip balm I coveted in elementary school. The lip mask is thick, moisturizing, and the perfect last step in your skincare routine. Am I really going to review a toothpaste? This Sensodyne toothpaste is the only toothpaste I’m aware of at the drugstore that is SLS free but still has fluoride. If you are unaware, SLS (Sodium Laureth Sulfate) is a drying agent and could be the main contributor to those pesky pimples you may get on your chin or around your mouth. Thank you for reading my post! If you are in support of this series and enjoy mini product reviews – please let me know in the comments! What beauty products have you recently finished? OMG I love the Kat Von D Tattoo Liner too! Isn’t it the best Teesh? 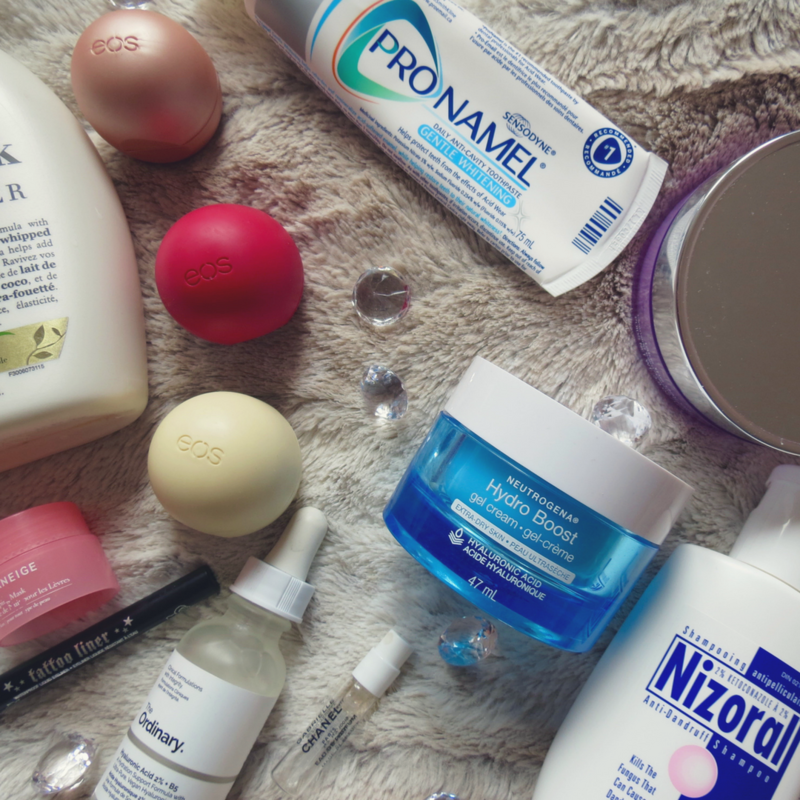 I always try to find a drugstore alternative and it never quite compares!